Easy to grow and ready to harvest in just 3 to 6 weeks. Make plantings of cool-season spring radishes every week or two for a continuous harvest until hot weather hits. Don’t forget winter varieties that produce large, fall-harvested roots. Prefers well-drained, loose soil, high in organic matter, free from stones, with pH 5.8 to 6.8. Needs plentiful, consistent moisture. A few winter radish varieties are biennials. Grows best in cool (50 F to 65 F), moist weather. Hot weather reduces quality and increases pungency. Late plantings may bolt before edible root forms. About 3 to 6 weeks before average last frost, direct seed � inch deep, 1 inch apart, in rows 12 inches apart. Thin to about 2-inch spacings. Crowded plants may not produce high-quality roots. Use thinings in salads. Cabbage root maggots - Use row covers made of nonwoven fabrics. Hoops can be used to make a tent area over rows or as floating row covers. For fresh radish, weekly plantings can be made. Some will avoid maggot attack. Clubroot - Locate new plants in part of garden different from previous year's location. If soil is infested, add lime to raise soil pH to 7.2. 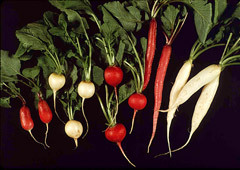 Browse radish varieties at our Vegetable Varieties for Gardeners website. The familiar spring radishes are small and fast-growing - usually ready for harvest in 3 to 4 weeks. Select varieties based on size and shape (globe or cylindrical), color (including red, purple, white and combinations) and bolt-resistance. 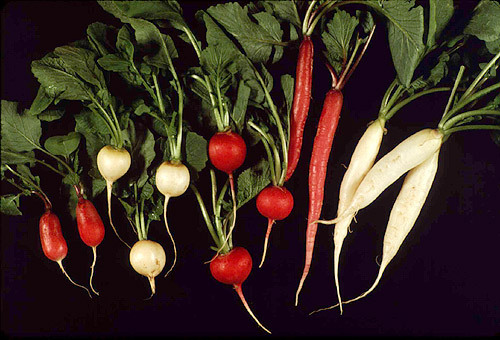 Summer radishes are similar, but take slightly longer to mature -- usually in about 6 to 8 weeks. Winter radishes (Raphanus sativus var. niger) grow more slowly (usually 2 months or more to maturity), produce larger roots (usually cylindrical), and hold their quality much longer than common varieties. They are also known as Oriental, Daikon, Japanese, Chinese, or Spanish radishes. Most are biennials that do not bolt as readily in response to long days, and only develop seedstalks after exposure to cold temperatures. They are usually planted in summer for fall harvest.